Are you tired of going to restaurant after restaurant and not being able to find anything that matches exactly what you want? If so, come to the Bagel Bakery and never have to settle for lass than perfect for your taste buds again! 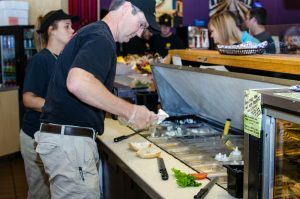 Yes, the Bagel Bakery gives you the option to create your own salad that satisfies your cravings, but did you know that we also offer our customers the option of building their own sandwich as well?! Any of 14 sauces including Mayonnaise, Chipotle Mayo, Mustard, Honey Mustard, Spicy Mustard, Blue Cheese, Caesar, Lite Italian, Cream Cheese, Red-Wine vinaigrette, Tzaziki, Hummus or Salt and Pepper. As if this deal couldn’t get any better, it only costs $7.49 for the sandwich, and costs only an additional $2.69 to make it a full meal with chips and a fountain drink. Stop by the Bagel Bakery today and forget about generic menu items that are not custom to your specific taste! We know everyone has been looking forward to May’s Menu Item Spotlight, and we did not want to disappoint, so we are highlighting one of our all-time favorite menu items: The Cocky Curry Chicken Wrap! 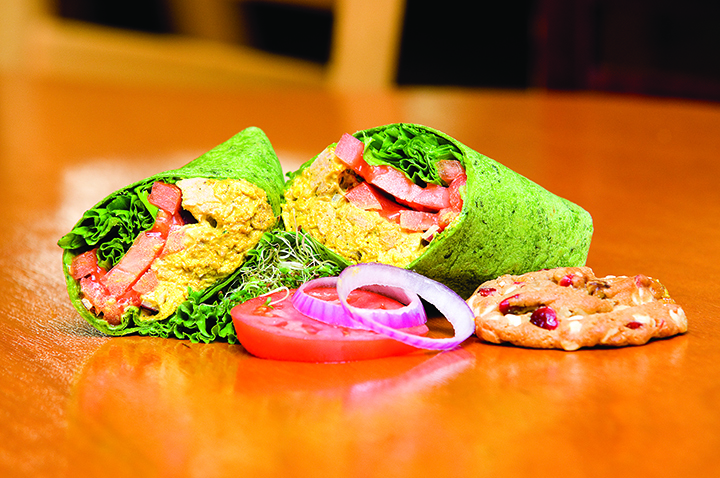 Our Cocky Curry Chicken Wrap includes our special curry chicken salad, stuffed inside of one of our delicious wraps, and paired with your choice of veggies. It is the perfect combination of spicy and refreshing, and will leave you feeling great and completely satisfied. This wrap is a light, protein-packed and flavorful choice for anyone who can handle a little heat. The veggies inside of the wrap give it the perfect cool, crisp and light crunch, that cool you down, not only from the heat of the chicken salad, but also from the heat of a summer day in Florida. Now picture this: you and your loved ones, sitting on a park bench in Gainesville, enjoying the end of the school year and the upcoming summer, and talking about all of your upcoming adventures, while eating a delicious Cocky Curry Chicken Wrap from the Bagel Bakery. Can you think of anything better? We can’t! For just $7.49, you can come to the Bagel Bakery and try this delicious summer wrap for yourself! We cannot wait to see you soon! Today, May 18, is National Pizza Party Day! Based on the title of this holiday, it is expected of you to maybe order pizzas from your favorite place for you and your friends, or invite your loved ones over and make your own personal pizzas. It may be just our opinion, but we think traditional pizza parties, where a group of people huddle around a TV and eat their favorite pizza pie, are completely overdone and no longer as fun as they used to be! Stop by the Bagel Bakery and order pizza bagels with your friends. 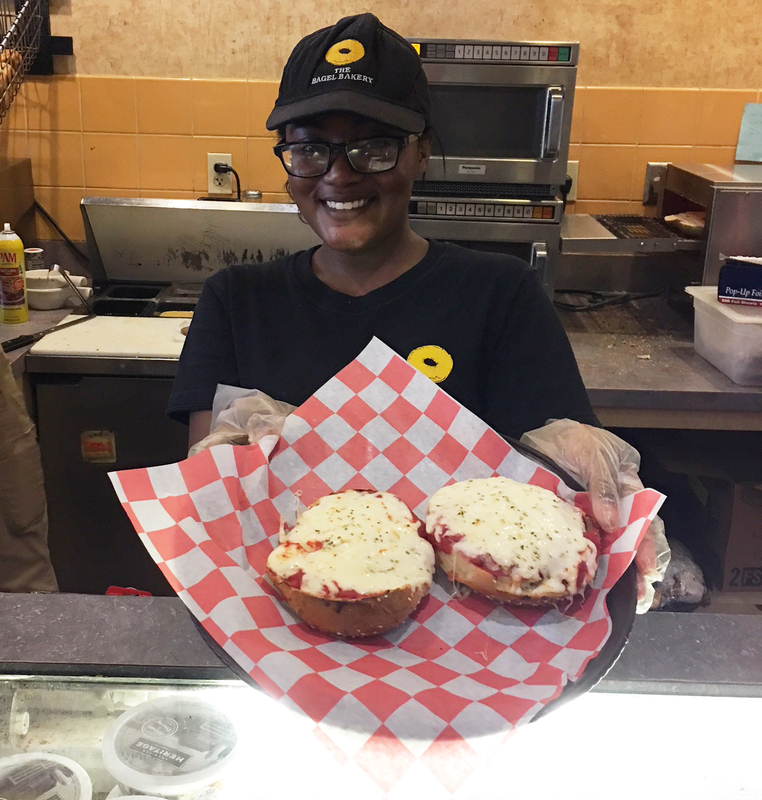 When you order a Pizza Bagel at our store, you get one of our freshly made bagels, topped with cheese (or not), and your choice of toppings such as pepperoni, ham, sausage, onions or Peppers. Pick up a Bag O’ Bagels or two from the Bagel Bakery, stop by the Publix next door to us and pick up your favorite pizza toppings, such as sauce, cheese, mushrooms, olives and pepperoni, invite your favorite company, put on your favorite music and have a build your own pizza BAGEL party!!! This year, break away from traditional celebrations and include the Bagel Bakery in on all of the fun! Can you think of a better way to welcome the month of May than to highlight another one of our employee’s favorite menu items? We can’t! This month, we are letting you in on our hard working and dedicated employee, Seth’s favorite item on our menu. Seth loves ordering a cinnamon raisin Bagel with the Honey Walnut Cream Cheese. “It is so creamy and so chewy, it is my favorite thing to order when I’m craving something sweet. The combination of sweet and a little salty is perfect,” Seth said. There is no better way to celebrate the school year coming to a close than with a sweet and delicious treat from the Bagel Bakery with your friends. You could even get a few to go and surprise your favorite teachers to thank them for their hard work throughout the school year. 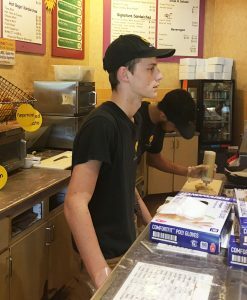 For just under $3, you can come to the Bagel Bakery, order Seth’s favorite menu item and see for yourself just what is so great about the Cinnamon Raisin Bagel with Honey Walnut Cream Cheese. We can’t wait to hear what you think!